Once perceived as a nutritional and occasional bonus, meat has now daily presence in the affluent West, serving human appetite for food. Although meat is not a product typically associated with luxury, its large ecological footprint poses the question whether it is time to challenge consumers' perception about animal-based proteins. 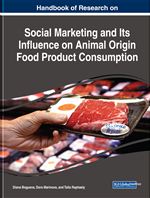 The purpose of this chapter is to gain a perspective on how consumers respond to the idea of meat being a luxury product. A 2017 Sydney study investigated the concept of luxury meat and meat consumption amongst three generations – Xers, GenY and GenZ. It shows the emerging meaning of luxury goods related to meat that is sustainable, healthy and socially responsible, in response to climate change and feeding the world's population. The Sydney evidence also suggests meat is no longer essential for human health. A shift towards plant-based and new meat alternatives can create more compassionate and environmentally responsible choices. The concept of luxury has had various descriptions throughout the years (Hennings et al., 2013a and b). According to the French fashion icon Coco Chanel: “Luxury is a necessity that begins where necessity ends” (in Husic & Cicic, 2009, p. 235). This famous quote refers to a particular life style described by the Oxford Latin Dictionary (1992, p. 30) as “extravagant living, (over)-indulgence”. Similarly, luxury is defined as enlightening, providing extra pleasure and flattering simultaneously all senses and is “the appendage of the ruling classes” (Kapferer, 1997, p. 253). Luxury provides numerous forms of physical and psychological values (Wiedman et al., 2007). The Merriam-Webster dictionary (2009, n.p.) explains luxury as “a condition of abundance or great ease and comfort” or “something adding to pleasure or comfort but not absolutely necessary”. Phau and Prendergast (2000) suggest that luxury brands evoke exclusivity, high brand awareness and perceived quality, and consequently attract customer loyalty. The qualities of: (1) life style; (2) abundance and access; (3) pleasure; and (4) loyalty, are major characteristics associated with luxury. What this chapter does is look at meat through the lens of luxury. Meat’s four luxury characteristics differ in a historical perspective – they manifest differently in the past, the present and the future. Whilst in the past availability and economic affordability determined meat’s luxury status, its environmental and public health impacts combined with ethical considerations are likely to influence its future. A diet with high meat intake has a much bigger environmental footprint – in relation to greenhouse gas emissions and climate change (Hedenus et al., 2014), biodiversity loss, land and water use (Marinova & Raphaely, 2017), peak phosphorus (White & Cordell, 2015), as well as serious negative consequences for public health (Marsh et al., 2016). Nevertheless, the global population continues to expand its per capita meat supply and consumption (Raphaely & Marinova, 2016) augmenting the need to understand the link with luxury. The consumption of meat also differs across geographies and nations. In the West nowadays meat is a daily nutritional source and not considered a luxury food while in cuisines like Korean, Bangladeshi or Ethiopian, it is more like a seasoning rather than main meal (Kaye, 2014; Smith, 2017). Environmental and animal rights groups (e.g. Animal Liberation Front, 2006) on the other hand argue that meat should be treated as a luxury because of livestock welfare and ecological considerations. A shift to seeing meat as a luxury in the West, can also potentially help preserve and reaffirm the traditional diets in the developing world which are generally healthier and rely more on plant-based products. The aim of this chapter is to unpack the four luxury characteristics of meat in order to encourage a new attitude and behavioural changes towards reduction in the consumption of animal-based products. Centennials: Generation Z or iGen, people born between 1996 and 1999. Luxury: A perceived necessity in excess of normal necessities which makes us feel better. Life Style: The way a person lives, including the objects and services s/he consumes. Loyalty: Support, allegiance or attachment demonstrated towards a particular person, place, organisation or objects. Millennials: Generation Y, people born between 1977 and 1995. Generation X: Xers, people born between 1965 to 1976. New Meat: Plant-based alternatives to animal products, including the flesh of fruits and vegetables.